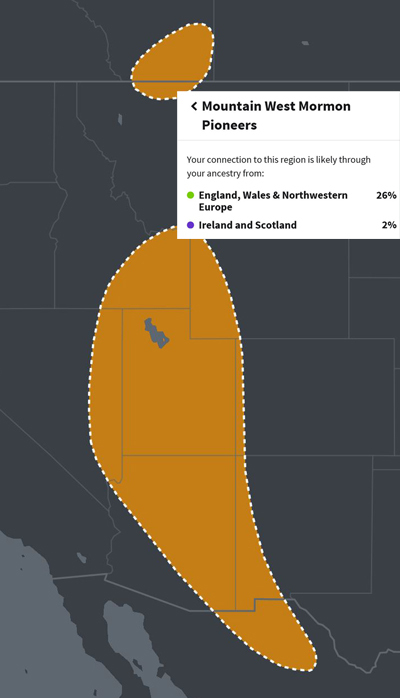 I recently had my Mother's DNA tested. This allowed me to more-clearly seperate the sources of my genes and contribute another good source of proved ancestry paths. One interesting revelation discovered from her results? Mom has .7% East Asian and Native American ancestry. And one more thing...she has MORE Neanderthal gene connections than I do...smiles. Neanderthals were ancient humans who interbred with modern humans before becoming extinct 40,000 years ago. 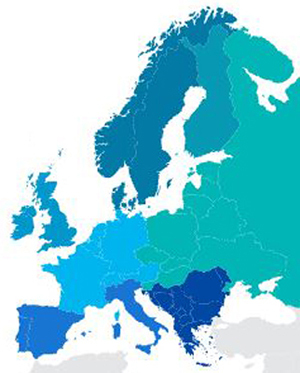 This report tells you how much of your ancestry can be traced back to Neanderthals. 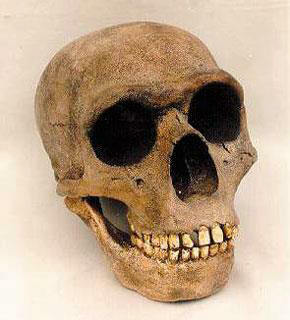 Over the past 150 years, scientists have found bones belonging to an extinctpopulation of ancient humans. These ancient humans are known as Neanderthals and were named after the site where their bones were first identified (Neander Valley, Germany). Neanderthals and modern humans share a common ancestor as well as many morphological and social traits, but differed in key respects. Over the past decade, genome sequencing has shed more light on the Neanderthal and our complicated relationship with them. Obviously, this PROVES all the brains came from MY side of the family tree...smiles. I have more Neanderthal variants than 81% of most tested. However, my Neanderthal ancestry accounts for less than 4% of my overall DNA. So...I got that goin' for me! (1st cousin, 965x removed). Smiles. 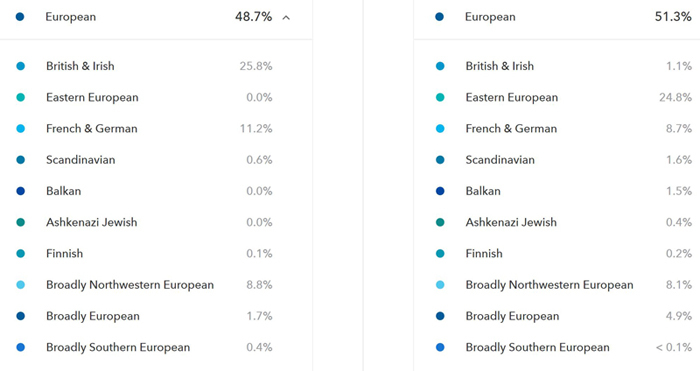 How much of each ancestry did I inherit from my parents? How many generations ago was my most recent ancestor for each population? This is the description of my DNA results from Ancestry.com. I also had my Mother tested. 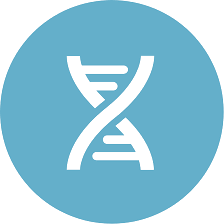 The AncestryDNA test uses some of the latest autosomal testing technology as a more comprehensive way to find family across all lines in the family tree. My test covers both sides...maternal and paternal. 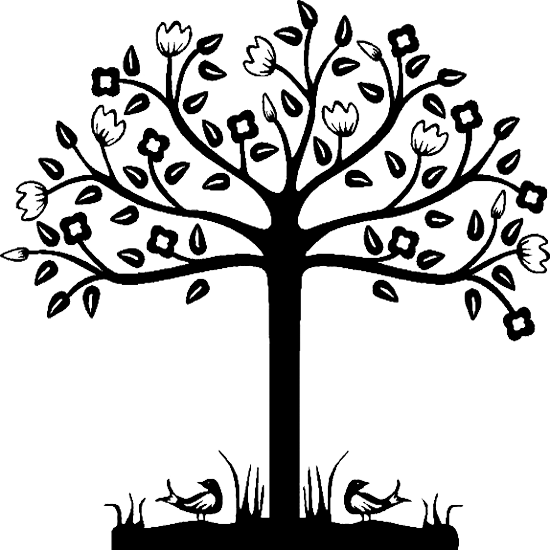 The online Ancestry DNA application is still in Beta testing, so features may be added or modified in the near future. This app displays all persons from our Family Tree who would have been a part of the time periods described. It is possible to zoom-down to show individual birthplaces on the maps. 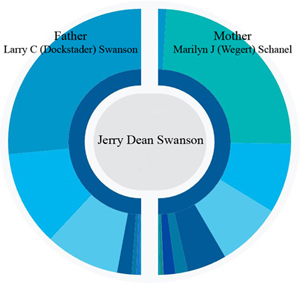 The following charts, images, and information concerning my DNA confirmed what we thought we knew about the Dockstader-Wegert Family Tree family migrations. Having those connections confirmed by DNA is gratifying. As you move through history in 25-50-year increments, you may visually plot the movements of our family. On the year charts, the larger the dot, the more of our family came/went to that area. In the application you may zoom in more, but I chose these levels for the screen-shots. 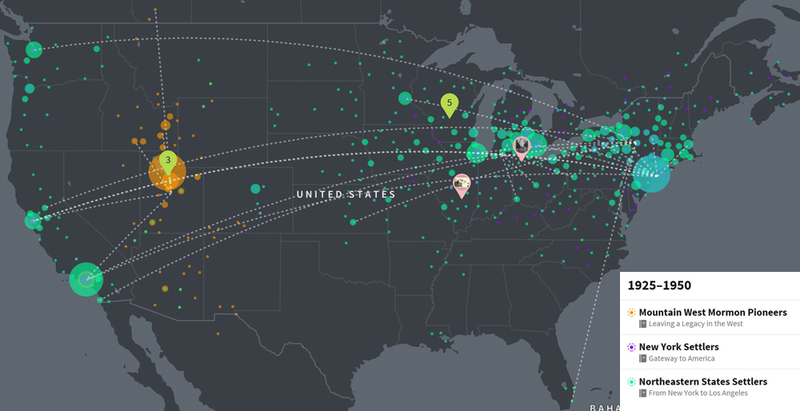 Can can literally follow-the-dotted-line to trace family movements. Quite amazing! And if you are bored with history...you might as well stop reading now...smiles. 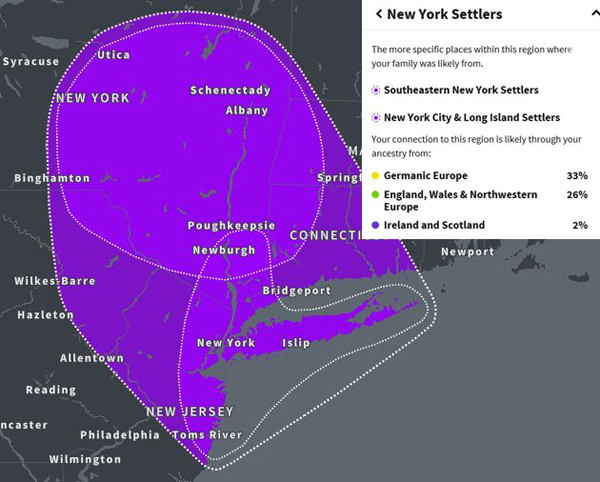 The following captions were created by Ancestry.com for my personal DNA webpage and reads much like a history primer. But it gives you context. The information gives you a better understanding of the who, what, where, and when history intersected with family and what they were surely experiencing at that time. After reading so many stories of some of the trials and tribulations experienced by some of our very brave ancestors, I am not so sure I would want to be going back to those so-called "Good old days". In 1830 Joseph Smith Jr. organized a new church that came to be known as The Church of Jesus Christ of Latter-day Saints. Plagued by political opposition and financial difficulties, its members moved from place to place across the Midwest, finally settling in the Great Salt Lake Valley. Converts from around the world began an exodus to join other members in their “Zion.” Over decades, Mormon pioneers and their descendants transformed desert valleys and mountains into flourishing cities across the American West. The Northeast was home to some of the first settlers of the United States, including English, Irish, Scottish, and German immigrants. With adverse weather and difficult terrain limiting any farming endeavor, colonists turned to fishing, shipping, and the timber trade. After the American Revolution many were spurred to leave their homes to build communities in Ohio, Michigan, Wisconsin, and Iowa. By the 1950s descendants of northeasterners on the East and West Coasts played an integral role in building the American landscape. In the 1700s, German Palatines fleeing cold winters and war, along with English, Scottish, and Irish immigrants looking for economic opportunity, joined the Dutch, French, and Scandinavians who had already made New York their home. As New York City grew into a capital of American trade, finance, and manufacturing, it became America’s most important gateway. New Yorkers have always lived in a city driven by commerce and dreams, and its greatest import has always been its people. At the start of the 18th century, English, German, Scottish, and Irish immigrants traveled in large numbers to North America. Encouraged by English pamphlets advertising cheap land and economic opportunity—and wanting to escape war and crop failures—these groups settled along the eastern coast from New Hampshire to Pennsylvania. The colonists had two choices for supporting themselves: make a life from the sea, or till the rocky, poor soil. What the Atlantic Seaboard offered in timbered forests and abundant waterways, it lacked in any deep, fertile soil suitable for large scale agriculture. With unyielding labor the settlers transformed the coastal villages into booming, internationally profitable ports. 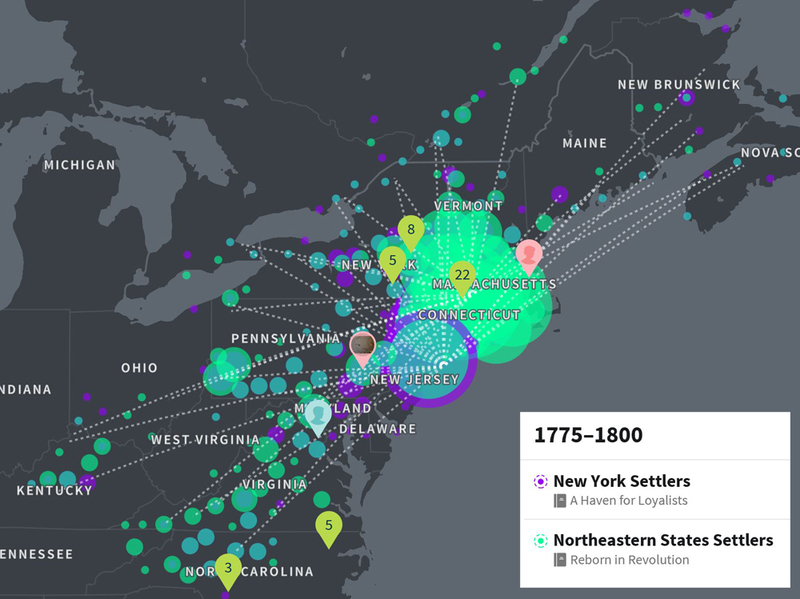 Leading up to the Revolution, New York City’s commercial exports rivalled, and even surpassed, those of Philadelphia and Boston. Even heavy-hulled ships could easily navigate the city’s deep, saltwater port that remained unfrozen throughout winter, so there was plenty of work to be found handling commodities like fur, timber, and iron that were shipped to the West Indies and England in exchange for luxury goods. Land was still available along the Hudson River, and immigrants from Germany, England, Wales, Scotland, and Ireland continued to flow into the colony. New England’s coastal economy continued to attract English, Scottish, and German settlers who found profitable work in logging, shipbuilding, and fishing. As the American colonies became engulfed in the French and Indian War, settlers on the outlying frontier lived under constant threat of attack, particularly in Pennsylvania. After the conflict ended, colonists were forced to house and feed British soldiers and their taxes were increased to pay the debt incurred by the British crown. In response, merchants boycotted British exports and tensions between the colonies and their motherland mounted. When America declared its independence, New York City consisted of around 4,000 buildings within a square mile at Manhattan’s southern tip. Some Continental soldiers sent to defend New York were both impressed and shocked by its wealth and worldliness. With war looming, thousands fled the city, which fell under British rule and became a military base. They were replaced by a flood of Loyalist refugees wanting to live under British protection. When the colonies won their independence, some of these Loyalists evacuated to Canada. After the war New York City rebuilt quickly and returned to the busy, cosmopolitan port it had been. It also served as a gateway to western lands, as New Englanders whose crop yields were declining left their overpopulated and rocky lands to settle the rich Iroquois lands along the Mohawk Valley. The first shots of the American Revolution were fired in the Battles of Lexington and Concord in Massachusetts. For the next eight years, Colonial revolutionaries seeking independence from England fought against battle-hardened British soldiers. Colonists suffered as armies from both sides confiscated food, supplies, and livestock. However, New York City was occupied by British troops and became a safe haven for Loyalists. When the colonies won their independence, the new nation had very little money to offer its veterans, but it had plenty of land. Some war veterans left the region and settled their bounty land in the surrounding territories. Others, including Loyalists, moved to Canada. In the 1790s, Wall Street merchants established a financial trade district. As a result, New York’s economy boomed and the city the ran around the clock. 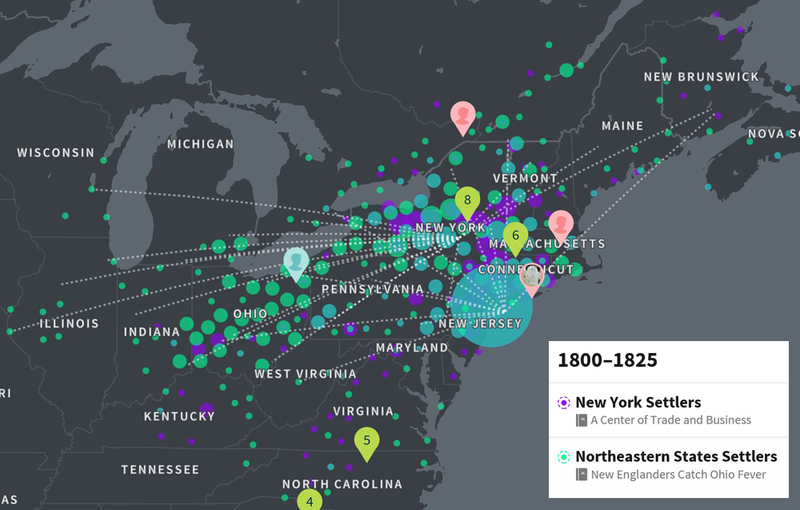 In the early 1820s New York surpassed Boston as the most important port in America. Agricultural products began coming down the Mohawk and Hudson rivers from settlements in western New York to be traded around the world, and cotton from the South was exported to textile mills in the Northeast and England. Population growth slowed during the War of 1812 but rebounded quickly after to its astonishing rate of more than 50 percent per decade. Renewed conflict with Great Britain in the War of 1812 caused destruction throughout the East Coast. Coastal raids and blockades devastated foreign trade, almost bankrupting the region. In addition the Industrial Revolution caused the population of New York City to explode, doubling in size every decade. Some northeasterners began to look to the frontier for opportunity. The Erie Canal, a technological marvel, was completed in 1825 and connected New York to Michigan. Because water travel was easier, quicker, and cheaper than traveling overland, the canal created a population surge in western New York State, Pennsylvania, and Ohio. In 1830 Joseph Smith Jr. organized a new church that came to be known as The Church of Jesus Christ of Latter-day Saints (Mormons). Church members followed their young prophet, settling cities like Kirtland, Ohio, Far West, Missouri, and Nauvoo, Illinois. Across the ocean, missionary efforts in the United Kingdom attracted thousands of poor converts desirous to join their fellow members in America. After heavy oppression by their neighbors and Joseph Smith’s eventual assassination, Brigham Young—the church’s new prophet—led followers across the prairies to Utah’s Salt Lake Valley. Completed in 1825, the Erie Canal linked the Midwest to New York City via the Great Lakes. Because water travel was easier, quicker, and cheaper than traveling overland, the canal created a population surge in western New York State, Pennsylvania, and Ohio, and allowed low-cost shipping of goods between the nation’s interior and New York City. Being a center of trade also turned New York City into a manufacturing hub. New York’s public transportation system expanded as rails for horse-drawn streetcars began crisscrossing the city. 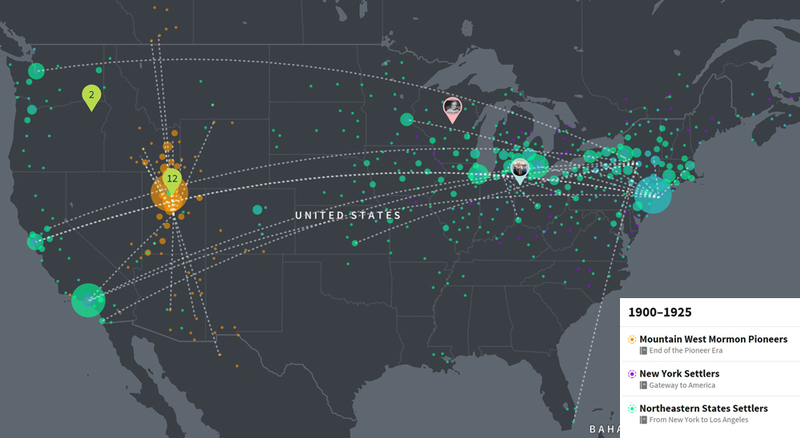 Mormon converts from England, Wales, Switzerland, and Scandinavia said farewell to their countries, jobs, and often families to relocate to America—a monumental undertaking. After a month-long voyage at sea, many embarked on an arduous 1,300 mile trek from Nebraska to Utah pulling handcarts or riding in covered wagons. Once they arrived, settlers fought to tame a new land, plant crops, and build homes, schools, and churches. By 1850 dozens of new towns had been settled from Brigham City to St. George. New York’s economy relied heavily on Southern cotton, and by 1860 almost a third of the city’s manufacturing jobs were in the garment trade. As the Civil War began, many New Yorkers were torn between their loyalty to the Union and their desire to protect their livelihoods and investments. But businessmen found opportunities to profit from wartime manufacturing, and the gulf between wealthy and poor widened. Lavish hotels, affluent neighborhoods, and huge department stores stood blocks away from slums, where the poor grappled with housing and school shortages, disease, and crime. After the war, some left the city for cheap, fertile farmland in upstate New York and Michigan. The California Gold Rush in 1849 motivated thousands of easterners, including many from New York, to head to the West Coast to “get rich quick.” And, despite the industrial prosperity in the Northeast, the allure of the American frontier called to many settlers. Advertisements for virgin soil in Wisconsin and Iowa, lured many away from the city in favor of settling and farming the American frontier. In fact, more than one-fifth of Wisconsin’s population in 1850 came from New York. As more Mormon converts arrived in Utah from Europe every month, the area’s population surged. Fertile, irrigated land became increasingly difficult to find, so many people were directed by Church authorities to relocate in settlements from Canada to Mexico. Some left to work on railroads or in mines, and the prospect of cheap, arable land led others to move to Idaho, Nevada, Arizona, and Colorado. Technological advancements in the steel and railroad industries brought prosperity and unparalleled growth to New York City. The Brooklyn Bridge connected Manhattan and Brooklyn, and steel skyscrapers and the value of Manhattan real estate both shot up. While the elite and middle class lived in modernized apartments with plumbing, elevators, and electricity, the poor and newly arrived immigrants struggled for survival in overcrowded tenements. Those who wanted their own piece of land found it in growing townships throughout upstate New York or by following railway lines to Pennsylvania and Michigan. At the beginning of the 20th century, Mormons were encouraged to build up existing cities instead of colonizing new settlements. Along the Mormon Corridor, populations increased, especially in southeastern Idaho. Some were attracted to California during its 1920s land boom. Others moved to northern Mexico and southern Alberta to escape prosecution for polygamy. Those who chose to leave the Mormon religion did not always leave the area. Many chose to stay in the Mountain West to be near family or because they were comfortable with their lifestyle. At the turn of the century, New York City’s famous subway opened and the streets above buzzed with streetcars, trolleys, and people of all nationalities. Though immigration slowed during and after World War I, by 1925, New York City was the world’s most populous city and a destination for millions from around the world. The Great Depression hit New York especially hard; one in three was unemployed. It wasn’t until World War II revitalized the city as a manufacturing center and port that it fully recovered. Some New Yorkers sought economic opportunity elsewhere, much of it factory work in the Midwest and West Coast. New York continued to be one of the most important economic centers in the United States. However, the Great Depression hit the Northeast hard and thousands of homeless refugees clogged the streets of New England applying for relief and standing in breadlines. The explosion of railroads made travel to western states easier. Oregon and Washington became attractive destinations because of their timber trade. Concerned with urban pollution and crime, many New Yorkers believed that a move to Los Angeles would aid in their physical health. Combined with oil booms and the burgeoning film industry, Los Angeles grew exponentially. During the Great Depression unemployment in Utah skyrocketed well past the national average, and rumors of labor enticed many to strike out for California. War industries in Utah and California resurrected the economy during World War II and men and women across the area found themselves employed again, and descendants of Mormon pioneers continued to transform desert valleys and mountains into flourishing cities across the American West. So...I totally bored you to no end? I hope not.